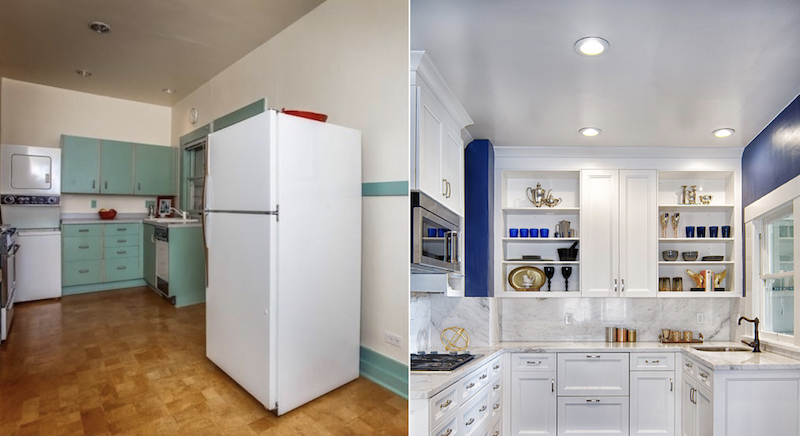 Standard, Mid-level, and Custom Kitchen Renovations: Which Kitchen Remodel Is Right For You? Many homeowners daydream about a kitchen remodel but waver on taking the first steps, perhaps because they are unsure of where to start or if the project will fit into their budget. Take the time to prepare with the right information and to determine what the scope of your project really is. You may realize that a kitchen remodel is well within your budget if you know what you want. Whether you are making basic cosmetic changes, remodeling an existing kitchen, or overhauling and building a new one, kitchen remodels offer a high return on investment for your home, so take that into consideration when beginning your kitchen renovation. See what category your dream kitchen remodel falls into to understand what budget you may need to start your project. A standard kitchen remodel is anything but basic. It has the ability to transform a well worn and loved kitchen into a fresh living space for your family to gather around. A standard kitchen remodel typically maintains the original fixtures and layout of the kitchen, which eliminates the cost of electrical and plumbing, allowing you to focus your budget on what makes the biggest visual impact. When it comes to the kitchen, cabinets typically make up the largest expense. Maintaining the existing structure of your cabinetry and giving it a facelift by painting or updating cabinet doors and hardware can leave a dramatic effect while minimizing the impact on your wallet. This standard Berkeley kitchen remodel received a facelift with fresh paint, updated countertops, and new cabinets. The deep blue paint pops against the white cabinets to create a brand new look for the kitchen. While new cabinets and countertops were installed, the footprint of the kitchen remained the same and no changes were made to the plumbing or electric, creating an upscale kitchen design with a small budget. A mid-level kitchen remodel takes the standard kitchen remodel one step further. While the standard kitchen remodel may use a fresh can of paint to refresh the kitchen space, here, you may replace with new wall tiles and flooring. Typically, a mid-level kitchen remodel will upgrade kitchen appliances, have higher-end cabinetry and can open up the kitchen layout by removing walls to create more space. When you have a bigger budget to work with, the possibilities open up with the ability to replan the kitchen layout for more space or splurge on a few luxury or custom items to help you out in the kitchen. This mid-level kitchen remodel in Oakland features luxury grade fixtures & finishes. Foundational changes included the removal of the dining room to allow for a larger kitchen layout and to increase the counter space, and additional cabinets were removed to create a large island with pendant lighting that the entire family can gather around. To complete the seamless kitchen design, the pitch of the ceiling was removed and leveled to create a sense of openness. If you are planning on a kitchen overhaul with custom redesigns, budget is likely not your first consideration. A high-end custom kitchen has endless possibilities and is perfect for the home chef that loves to entertain or to allow for a eat-in kitchen. The custom kitchen remodel often involves structural changes to the kitchen to seamlessly integrate the kitchen with other rooms in the home to create a more central and inviting layout. These changes can include removing walls between rooms, adding square footage to the existing space, or expanding the height of the ceiling. Rich and luxury materials are also used to complete the look. This custom kitchen remodel in Piedmont breathed new life into an old galley kitchen by creating a larger modern open concept kitchen that included an island with seating, new high end cabinets and countertops, and enhanced access to the nearby deck. Custom storage was built into their wall to ceiling cabinets. Additional windows were installed along the west wall to take better advantage of the view that overlooked the East Bay Area. Well-prepared homeowners understand that the first step to any kitchen remodel starts with speaking to a pro to understand the scope and costs of the work. HDR Remodeling is happy to help any homeowner take the first steps to budgeting, designing, and building your perfect kitchen. Take a look at the cities we service to see if your city is one of them, and contact HDR Remodeling today for your free in-home consultation where our Design Specialist will walk you through the process and provide ideas for your kitchen that fit your budget.